If you LOVE Kix Cereal... and you've yearned for a sweeter, more wheat-ey version... you may like this cereal. If that does not describe you, this cereal is a dud. I was struck by how much this cereal reminded of another new cereal I reviewed recently... Jumbo Krispies from Kellogg's. Honey Kix is made up of smaller pieces that stay crunchy longer, but both cereal have a similar lackluster, non-descript sugar flavor. While Jumbo Krispies has a texture that turns to mush immediately in the mouth, Honey Kix takes an initial chew to achieve that same unpleasant, prematurely mushy, stick-to-your-teeth texture. The sad bottom line is that there's nothing special about this cereal. It's too sweet and it's no fun. Nutritional Considerations: Each 1 and 1/4 cup serving has 120 calories, 1 gram of fat (0 grams trans and 0 grams saturated), 0 mg cholesterol, 28 grams of carbs, 3 grams dietary fiber, 6 grams sugars and 2 grams protein. What do you think of Honey Kix? I didn't like the taste very much. I love Berry and regular Kix so I was excited to try this new version. 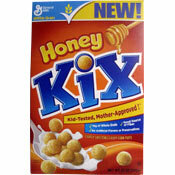 I was really disappointed with Honey Kix though. It's too crunchy, the texture is weird and i didn't even get the slightest hint of honey from this cereal. I guess I expected more of a Honey Nut Cheerios flavor. I don't recommend this. 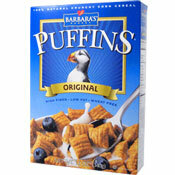 This is one of the best "healthy" kid cereals out there. How can you not like this? Regular Kix is for old people. I personally really like the honey kix.